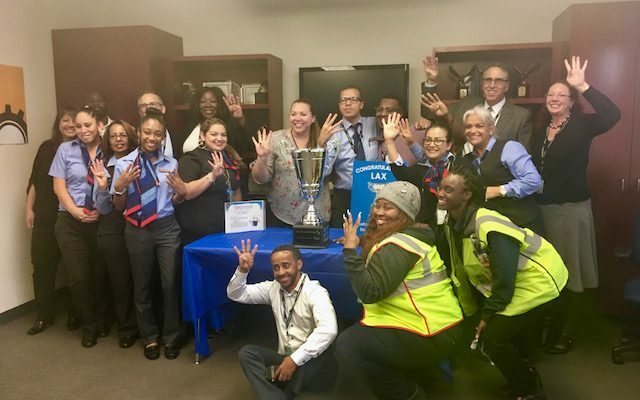 The glitz and glamour of Hollywood couldn’t hold a candle to the sparkle from the Envoy and American teams at Los Angeles (LAX) during their Customer Cup celebration. After quite a challenging year, they pulled off their fourth win since the Customer Cup program started in 2008. LAX exceeded all five goals in the Customer Cup metrics. Let’s talk numbers for a minute. The Envoy and American team at LAX team improved the hub’s departure performance (D+0) by 11.1 points, and their turn performance (T+0) by 9.3 points year over year. Even more amazing, they improved their baggage performance (MBR) by 27.3%. They’re not done impressing us, though. They reduced customer complaints by a whopping 29.4%. That’s an incredible feat for this amazing team. “We had the best year over year improvement for all American’s Hubs and Gateways for D+0 and Customer Complaints,” shared James Moses, American Airlines Managing Director – LAX. The LAX team is a big one, and their leaders didn’t want anyone to miss out on the celebration…so they went mobile. Jim was joined by Joseph Taney, American Airlines Senior Vice President – Hubs & Gateways, and Suzanne Boda, American Airlines Senior Vice President – LAX, as they walked the Customer Cup trophy from location to location within LAX. They thanked team members in Flight Service, Flight, Tower Ops, Maintenance, Facilities, and Cargo as they went…serving cake and shaking hands with the LAX family. Indeed, this team is glowing with pride. They chatted excitedly at a gateside celebration, posing for selfies with the Cup and accepting congratulations from senior leaders. At a total of four wins, we tend to agree. This team has shown that they can run an on time operation and deliver great customer service to the travelers of La La Land. The Customer Cup is definitely the biggest award in town. Oscar who?